Marc Marquez won the inaugural Thailand Grand Prix as he pipped Andrea Dovizioso in a thrilling final corner showdown. In a thrilling last corner battle, Marc Marquez (Repsol Honda) beat arch-rival Andrea Dovizioso (Ducati) to claim victory in the inaugural Thailand Grand Prix. Behind them was a resurgent Maverick Vinales, who ended Yamaha’s podium drought by finishing in third. 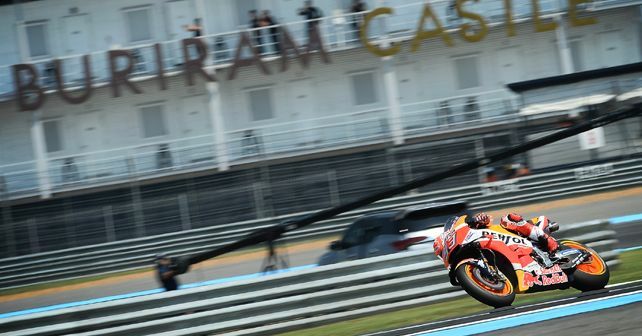 Although Marquez qualified on pole for the race yesterday, his race pace was evenly matched by Dovizioso as well as Yamaha’s Valentino Rossi and Vinales. In fact, Rossi qualified second, showing that Yamaha has clearly stepped up their game after having dismal performance in the last rounds. With the track temperature soaring higher than in any of the European rounds, choosing the right tyre would prove out to be critical. Michelin suggested all riders to go with a hard compound rear tyre. All of the riders – except Aprilia's Aleix Esparagaro – took the tyre manufacturer’s advice and raced with a hard tyre. The race began without any drama as Marquez held station at the front, followed by Rossi and Dovizioso. However, in the initial laps, Marquez tried to control the race without showing his actual pace. Dovizioso ran a similar strategy. Their slow pace allowed Rossi to take the lead from them, while it also helped the second group of Cal Crutchlow (LCR Honda), Vinales, Dani Pedrosa (Repsol Honda) and Aleix Rins to bunch up with the leading pack. For 12 laps, this game of hide-and-seek continued. But with half the race over, Dovizioso and Marquez overtook a struggling Rossi to turn the first ever Thai GP into another Ducati and Honda duel. And while they were on it, Vinales, too, got the better of his teammate and took the third spot. Pedrosa was looking stronger for a podium fight as well, but he crashed out from fifth. The last three laps saw the top four riders playing it out for the win. That said, it was yet again a battle between Dovizioso and Marquez as they were glued on to each other with Vinales and Rossi close behind. It was an intense battle with Marquez trying all his might to break Dovizioso’s rhythm, but he couldn’t quite keep the Ducati rider at bay as he trailed him going into the last lap. At Turn 5 in the final lap, Marquez made the crucial move and made it stick by blocking Dovizioso from getting back into the lead. Then, as we’ve come to expect from these two, it was all down to the last corner. Dovizioso made a brave move there, however, this time it was Marquez who came out as the winner of the two as he outwitted Dovizioso to run wide and crossed the finish line 0.115s ahead of him. Vinales finished not too far behind in third (+0.270s) with Rossi taking the fourth spot. It was an overall good day for Yamaha as Tech 3 Yamaha's Johann Zarco was fifth. Rins managed to take sixth, ahead of Crutchlow (seventh). Angel Nieto team’s Alvaro Bautista finished eighth. Pramac Ducati’s Danilo Petrucci and Jack Miller rounded out the top ten in ninth and tenth, respectively. Marquez is leading the championship by 77 points now and there are only four more races to go. If he maintains his lead over 75 points after the next round in Motegi, he'll be crowned champion there!